The Clark Engineering Scholars Program was established at GW in January 2011 with a generous gift from the late A. James Clark, Eng.D. 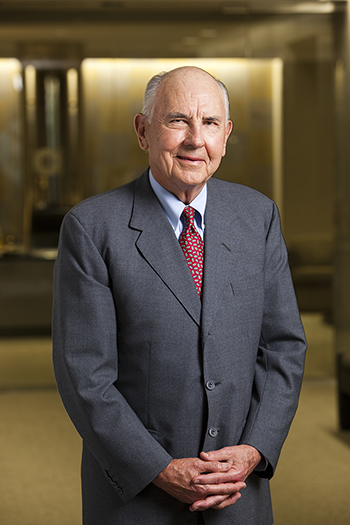 '10, former chairman of the board and CEO of Clark Enterprises, Inc. In 2017, the A. James & Alice B. Clark Foundation doubled the program’s endowment with an additional investment of $8 million, further enhancing the program for scholarship recipients. Today, the Clark Scholars Program is the A. James & Alice B. Clark Foundation’s signature academic program, combining engineering, business, leadership and community service. As part of a commitment to building the pipeline of future engineers, the Foundation has partnered with some of the nation’s leading engineering institutions, financially supporting students who exhibit strong academic and leadership potential. Each student selected as a Clark Scholar is awarded an annual need- and merit-based scholarship, renewable each year based on academic performance and participation in the program. Applications for the 2018-2019 academic year will open in January 2019. Applications will be evaluated by a panel of faculty, practicing engineers, alumni, and current Clark Scholars. The panel may solicit additional input. Based on the application materials submitted, the panel will select finalists who will then be required to appear for an interview before the selection panel. The final selection of new Clark Scholars will be based on both the interviews and the students' applications. The core curriculum reflects Mr. Clark’s values in business and in service to his community. The selected Clark Scholars will be required to attend a leadership boot camp, scheduled for late August every summer, and must participate in internships, study-abroad, and regularly- scheduled seminars. Additionally, scholars will be required to complete a business or management course and take part in community service. A. James Clark never forgot that his business successes began with an engineering scholarship. That is why the Clark family has long supported extending engineering education to talented students from underrepresented backgrounds, including first-generation college students. Mr. Clark’s belief in the power of hard work enabled him to grow a local construction company into a national success. And it guides the philanthropic giving the A. James & Alice B. Clark Foundation continues in his name today — from scholarships for engineering students to better schools for D.C.’s children to veteran reintegration programs and support of the D.C. community.